This new project is a mid-rise condominium in the pre-construction phase in Toronto’s Fashion District. Developed by the Pemberton Group, it’s proposed to stand 15 storeys with 476 units. 543 Richmond Residences at Portland has an occupancy date of 2021. These residences set a new standard for living in the city and suites are selling now. Pricing, floor plans, deposit structures and maintenance fees are all information available through our platinum agents, so do not hesitate, this is your chance to access the best units at the best pricing. The building, set to be designed by Quadrangle Architects, will be U-shaped, occupying the southwest corner of Richmond Street West and Portland Street. The structure’s unique shape will allow for a publically-accessible, landscaped courtyard to be incorporated in the centre, while allowing for outdoor amenity space to be located on the 8th and 2nd floor. 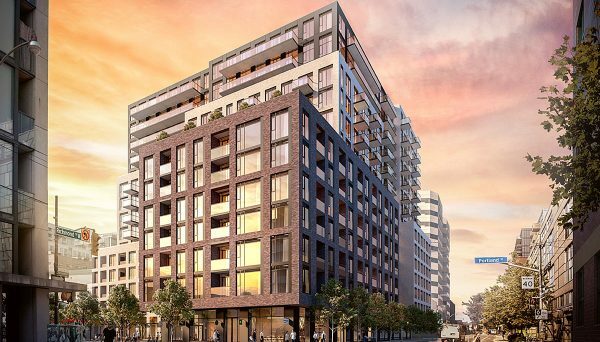 The mid-rise portion will be anchored by an eight-storey podium, while the remaining seven floors will feature stepbacks, terraces and wraparound balconies, adding a textured, architectural appeal to the site. Pemberton Group pulled out all the stops with all the meticulous details applied to this one-of-a-kind project. Each suite will come equipped with stainless steel appliances, custom contemporary kitchen cabinetry, quartz countertops, roller shades, 9-feet smooth painted ceilings, laminate flooring, stacked washer and dryer, and year round temperature control. These residences will be a move-in ready oasis. Two levels of underground parking are proposed, which will include: 262 spaces for vehicles and 659 spaces for bicycles. The unit mix is expected to range from 370 to 1,045 square feet. Floor plans consist of 6 bachelor units, 171 one-bedroom units, 185 one-bedroom-den and 174 two-bedroom units, a diverse combination suitable for a wide range of professional owners or tenants. 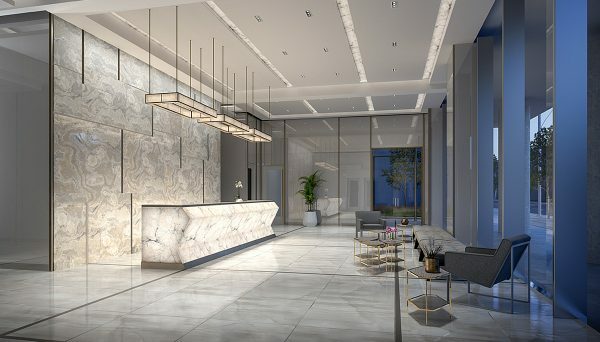 The residential lobby is expected to be accessed along the site’s western façade where 24-hr concierge service welcomes you and your guests. The building's mezzanine will be the pinnacle as it will house a seasonal outdoor pool, a large fitness centre, games room, video room and party rooms. On the 8th floor, a quiet study room and a rooftop lounge offers a space for work and play. This new condo project is located in a portion of downtown Toronto designated as a “regeneration area.” The immediate area is occupied by a mix of historic warehouses, modern condominiums and mixed-use buildings, but the regeneration designation is encouraging the restoration and re-use of many of these existing buildings, along with the revitalization of sites that are underutilized. These policies are encouraged to house the expected growth for the city’s downtown, meaning it’s a great time to invest in property here. Just down the street, we’ve seen a handful of residential redevelopments, including a 14-storey loft conversion recently approved by the OMB. We’re expecting this Fashion District condominium to complement its surroundings while adding a contemporary touch to the neighbourhood, suited for its role as a major urban destination. Young professionals, creative types and executives who crave the downtown energy, flock to this neighbourhood, both for its unique architecture and proximity to some of the city’s hottest restaurants, clubs, bars and art galleries. It’s mere steps from the trendy West Queen West area and the Entertainment District, both vibrant pockets throughout the day and night. Charming and walkable, the site also scores a perfect 100 on its Transit Score. It’s steps from two 24-hour streetcar lines and a few minutes’ ride to the nearest subway station, making it a great option for those who work downtown and like to walk or take public transit, which studies show many contemporary homeowners do. The site is a short commute to Ryerson University, The University of Toronto and George Brown College, as well as a massive redevelopment just minutes away on King Street West that will see the inclusion of a new OCAD campus. As an extra bonus, this building is also a short stroll from the popular Trinity Bellwoods Park, another reason units here are often in high demand. The park is a popular destination in the summer, featuring farmers’ markets, art shows, yoga classes and plenty of leafy trees and space for picnics. The Pemberton Group has spent decades building a reputation for high-end residential and commercial developments throughout the GTA. We’ve seen innovative designs, upscale finishes and dazzling amenities in many of their buildings. In Toronto, they favour dynamic neighbourhoods with access to rapid transit and proximity to urban hotspots. Read more about The Pemberton Group.